Last May, WestJet placed an order for up to 20 Boeing 787-9s (10 firm orders and 10 options), which was a huge move for the Canadian carrier. Otherwise WestJet’s fleet primarily consists of 737s, as well as a few 767s that they use primarily for transatlantic flights. Expanding their fleet with brand new Boeing 787s is a big next step for the carrier. 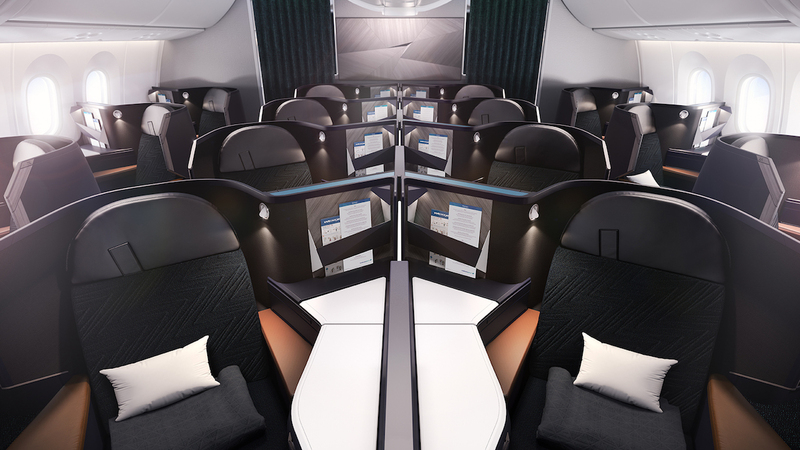 The airline will be getting their first 787-9s early next year, and this May they revealed the interiors of the new planes. 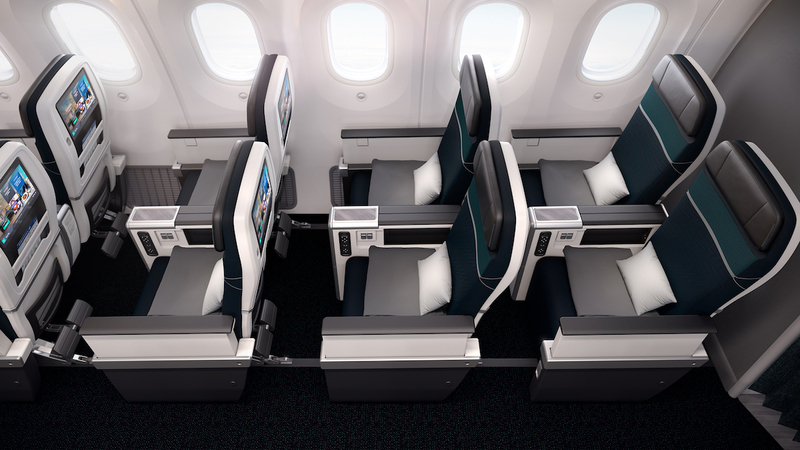 WestJet’s 787 interiors are mighty impressive, and look a whole lot like Air Canada’s 787s, minus the finishes. 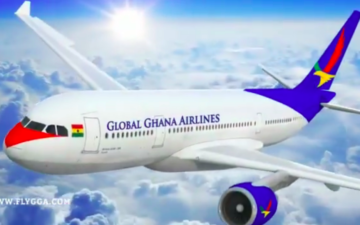 The planes will feature 304 seats, including 16 business class seats, 28 premium economy seats, and 260 economy seats. 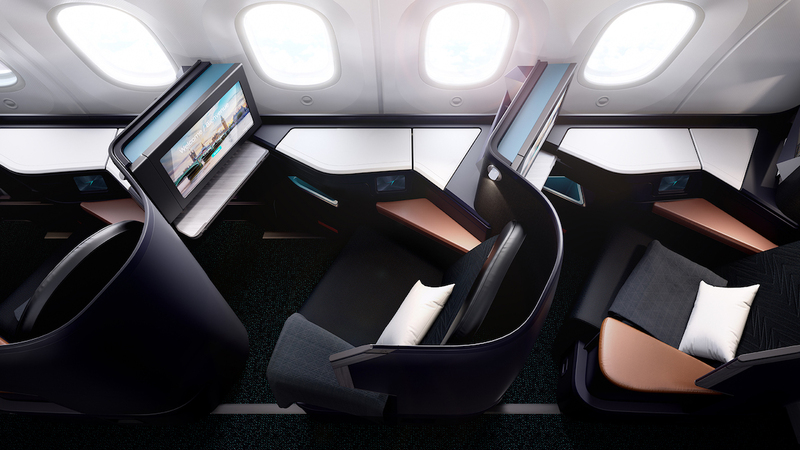 Business class will consist of B/E Aerospace Super Diamond reverse herringbone seats, which are exactly the same ones that Air Canada has. 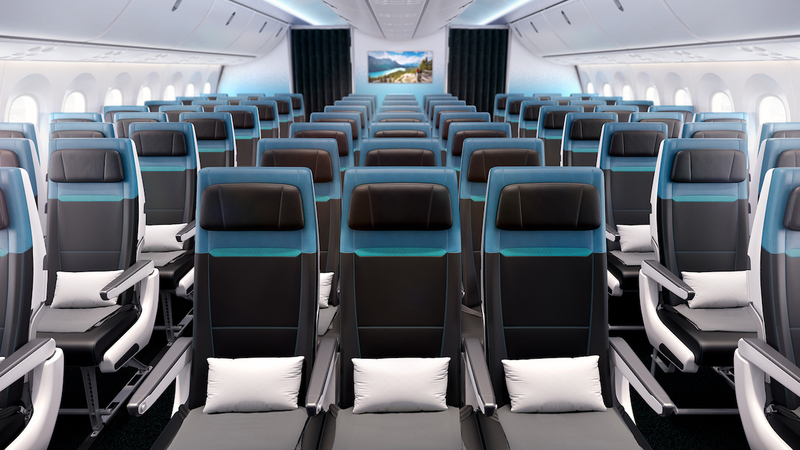 Business class will feature touchscreen service, on-demand dining, and turndown service. 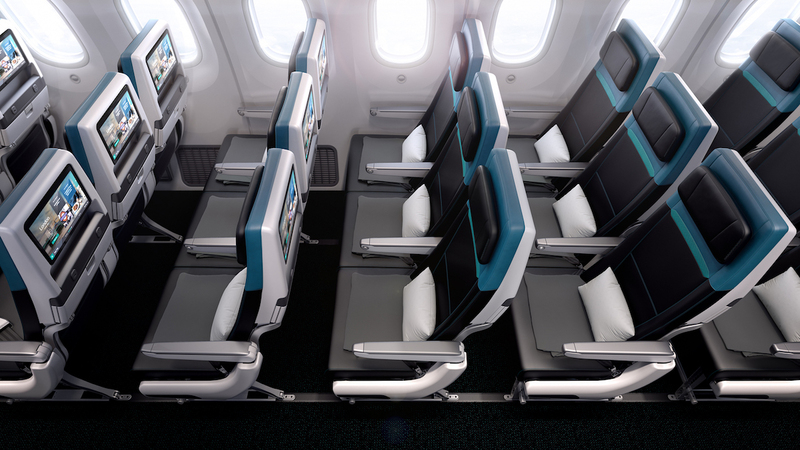 Premium economy will be in a 2-3-2 configuration, and will feature a premium menu, a self-serve social area, and more space to relax. Economy will be in a 3-3-3 configuration, and will feature entertainment and power ports at every seat. WestJet has now officially revealed the first longhaul routes to get the planes, and these flights should be going on sale today (some of the flights are already on sale, though I don’t see the business class cabins on sale yet). When WestJet ordered the 787s, my expectation was that they’d use it to expand to new markets. I had heard them mention the possibility of flying to Asia and Australia, for example. Otherwise my expectation was that they’d try to compete directly with Air Canada in some business markets to Europe. But they’re taking a different approach instead. WestJet will be basing their first few 787s in Calgary, and they’ll operate flights to Europe. So it’s interesting that they’re using these planes to fly out of Calgary to European markets they already serve out of other airports. On one hand I guess it’s smart for them to try to capture a new market, though on the other hand they’re competing directly with Air Transat on the London Gatwick route. I’m very curious to see what their business class pricing is like, and can’t wait to give WestJet’s new 787 business class a try. WestJet has been struggling financially lately. I’m not sure if it’s because they seem to be heading in several different directions, or if it’s rather that their old business model wasn’t working anymore, which is why they’re trying so many new things. 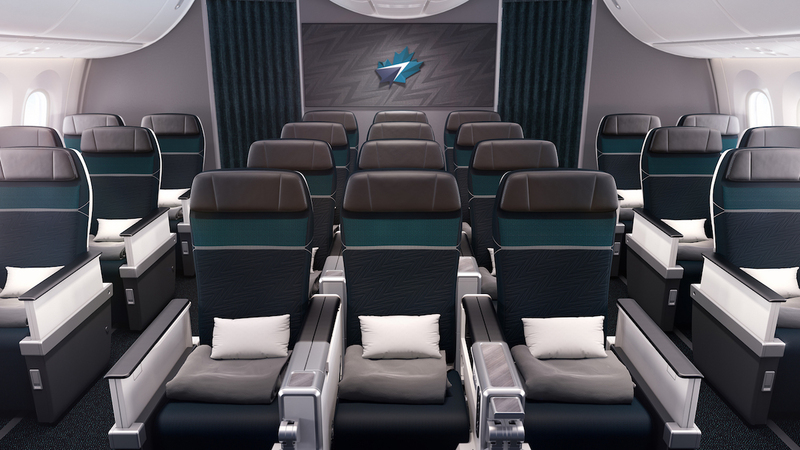 At the moment WestJet is launching an ultra low cost carrier, and at the same time adding a proper premium cabin to their short-haul planes, and also introducing some new longhaul aircraft. What do you make of WestJet’s first 787 routes? Yesterday Ben wrote about how Qatar was threatening to leave the oneworld alliance (but wouldn't). One of Qatar's reasons was because of fellow oneworld member Qantas, where Qatar said: "It is blocking us getting rights into Australia"
Makes sense, Calgary isn’t a very competitive market, and most of the options out of the city are quite bad. Wouldn’t be surprised if they added a Japan route tbh, they’d have no real competition in Calgary. Still wouldn’t fly them, but who knows. @Lucky – sorry to be so off topic, but on my lates Amex bill, in the summary of program changes on the last page, it says that the “International Dolla Platinum Card” will now earn 2x points on dining. Google doesn’t turn up much, except the annual fee is 550 usd. Do you know anything about this product? 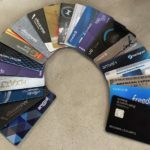 Can I switch my regular platinum card product to it? Is it friendlier for people who travel oversees often? Also of note is that the Mercedes Benz Platinum will no longer earn MR points which I find interesting, not that it effects me. Also on topic, it seems WestJet is replacing their 767 routes with the 787 first. Thats a huge upgrade for passengers. Theyve also hinted at entering South America with their 787s eventually, will be interesting to see if their JV with Delta helps there at all. I wouldn’t fly them either, *yet*. If there’s a real premium cabin and if they join an alliance so I can redeem real points for flights on WS, then bring it on. Until now, they’re an LCC with lipstick. Oneworld is more likely than Skyteam, IMO. But then, I predicted that for Porter and look what never happened there. Excuse my typos, was on mobile. I would have no problem with trying out Westjet’s long-haul premium cabin. Unfortunately, I don’t live in a place which makes it feasible! However, my understanding is that Westjet does not offer much of a discount relative to Air Canada, so I’m not sure it’ll be too much of a deal. In the Great Circle Map in the post, the YYC-CDG route makes a stop at Gatwick. Is YYC-CDG a non-stop or does it indeed have pick-up/drop-off rights? Nevermind…just mapped it myself on GCM and the routes are so close they lines overlap. Asked and answered. Another transatlantic route for Dublin, it’s astonishing how much they’ve added in a short time. An interline agreement with FR or EI would be a great help with pax numbers you’d imagine. I’m still waiting for WS new frequent flyer program. They’re partner setup is similar to what AS has, aka sprinkle of both skyteam (including DL, AF and KE) and oneworld partners (including CX, QF and JL). If the earning and redemption rates are decent for me (something like 80k or less for one way na-asia flight), this may be my new favorite. @DenB, considering the JV with Delta, I’d say SkyTeam would be far more likely an alliance than Oneworld. With the CDG route and KLMs current AMS route they could benefit from AF/KL as well. My guess is that this wouldn’t happen for a few years at least. As for the new routes, I think YYC makes a lot of sense. They have a great network from all over Canada to feed into the airport and they don’t have to introduce an entirely new product/business model while competing against AC in YYZ or YVR. The only destination that kind of surprises me is DUB, as it’s seems much more of a leisure destination than the other two. Alberta’s oil and gas industry is huge so there’s a fair amount of business travel in and out of YYC. Of course, Banff brings in tourism traffic from all over the world so I’m sure that helps. I wouldn’t be surprised to see them try a TPAC route at least seasonally at some point. I believe PEK is currently the only TPAC destination from YYC. @DenB Why do you think OneWorld is more likely? WestJet has a JV with Delta and Delta is arguably the more diserable of the US airlines to be aligned with. Plus, WS is already operating a flight into a SkyTeam hub (CDG). WS used to have a agreement with AA but the relationship wasn’t maintained and they were replaced by Delta, so I can’t see why OW is more likely. @chub yup, I am aware of the flight, but it’s a horrible flight on a 767. Calgary isn’t a premium market, so they always get the worst equipment. If I was Westjet I’d be looking to usurp these casual traveler routes from air canada. Yea, the AC 767 isn’t pleasant. I do hope for YYC-NRT from JL or WS, they’ll benefit with connections from each other (WS feeding JL at YYC or JL feeding WS at NRT). This will be interesting. And they can steal passengers that are taking the AC/NH YYC-NRT. I just priced it… one way from YYC to CDG/LHR is $4000USD… but return is actually cheaper… CDG-YYC is $1500USD… but RT in J is basically $6000USD. I am not sure if I can justify it! I wonder if British Airways knew something when they recently stopped flying to Calgary from Heathrow for Winter 2019!?! AC pricing to Europe for J runs $6000 to $10,000. That is pretty outrageous. Hard to justify paying out of pocket. I never pay more that $3000 to Europe out of US in J. I think it would be easy for WH to compete w AC at least in premium category. I have flown AC transcontinental in brand new 787 in J and experience was excellent. @Phillip – It’s just temporary. BA are returning to Calgary in spring once the 787 engine issues are under control. Glad to see more long haul routes out of YYC though. LHR, LGW, AMS, FRA, ZRH, NRT and PEK are the only ones I believe. Europe first to get a feel for the 787 and shakedown international ops, then tackle the Pacific? RBC and westjet are supposed to have a new loyalty program called ampli. But it has been very quiet. Westjet has been consistently higher priced then air canada on most routes and those business class prices are way out of line. 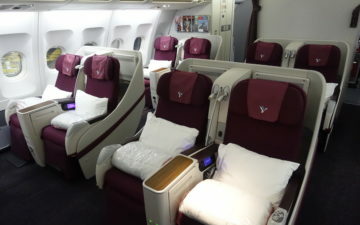 Furthermore at only 16 business class seats there is not much room for rewards. Don’t forget to include a review of the Westjet lounge in your flight review. Calgary is WestJet HQ, hence the decision to start flights from there. You can earn and redeem points for Westjet with Flying Blue. WestJet started out as a low cost carrier built pretty much on the model of the highly successful Southwest: No frills and single aircraft type to minimize training and maintenance costs. Initially, it was quite successful. Now, it is struggling financially. And what is it doing? Expanding international routes, adding premium class services and buying a bunch of 787s. Does anyone remember how long People Express lasted after it added first class service, acquired a 747 and started transatlantic service?